Beautiful, vintage French, hand crafted, bent twig. gathering basket. A lovely shape and a good large basket that would probably have been used for harvesting grapes. A sturdy basket, well made, with a dark patina. Nice bentwood handle. Vintage baskets have the odd nick and nibble here and there. This basket is in very good condition. 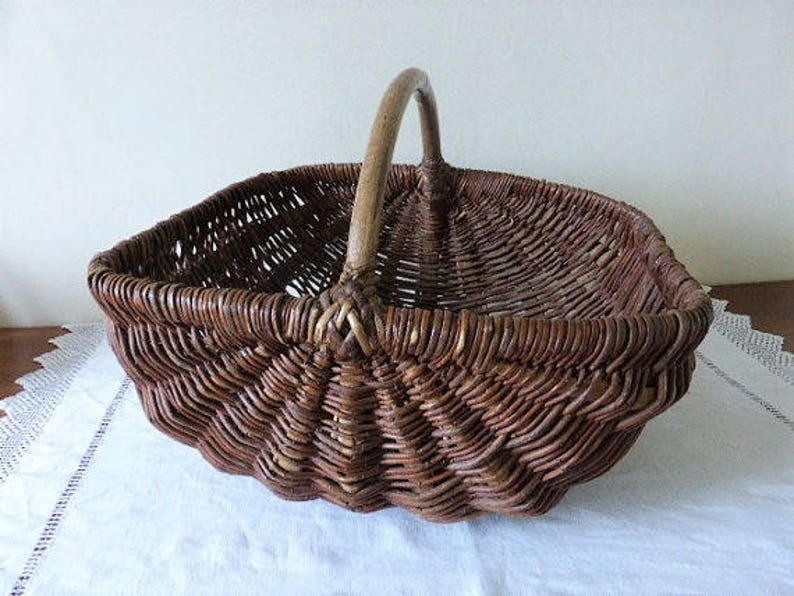 Great basket for harvesting fruit and vegetables but would look equally good as a market basket or to display in the home with linens or magazines, or maybe to store vegetables in the kitchen. It measures 19.5" x 17" x 14"
The French have a special love affair with the basket. Over the centuries, the basket has been used by households rich and poor, in the city and country, carried by men and women: a simple, universal, utilitarian item. The trade of basket making is recorded since the late 11th century in France, and over the ages it became highly specialized within different regions of France and by intended use, including: harvesting grapes (each wine region has their own unique basket shape and name), picking olives and gathering lavender, carrying glasses and bottles, making bread (in baskets with canvas lining); carrying eggs or freshly caught fish (various fish have unique baskets); raising chickens, storing wine (in glass jars covered with basketry to keep the light out); carrying firemen’s water (in a zinc-lined basket); carrying clean or soiled laundry…you get the idea. Every item will be very carefully protected , very carefully packed and shipped within three working days. If you would like to purchase more than one item, please send me a message, to request a combined shipping cost. All items are tracked. If you require recorded delivery and insurance please contact me for a revised shipping cost. Packed securely for the long voyage. Thank you. These plates are stunning! Item was exactly as described and photographed. Packaged very carefully. Item is stunning and seller so helpful. We welcome payments made via Paypal which accept all major credit cards, and is Etsy's recommended partner. It's fast, simple and safe - no registration is required, simply enter your details at checkout. Prices are listed in USD, but will be automatically exchanged by Paypal into your own currency if different. Please indicate the address you would like the item(s) to be sent to in the message box, available during the transaction, or convo us directly. If you have a Paypal account, please ensure your mailing address is up to date. Once payment is received, we will carefully pack your purchase and send it out, usually within 3 -5 working days of payment, and we will inform you of the time schedule. In the event of any refunds, the buyer will be responsible for any Paypal fees incurred. Items not paid for within 3 days will be re-listed, so please convo if you are having any problems with the checkout procedure. We are now offering a LAYAWAY plan. Please contact for details. I will reserve an item for one week without deposit and for three weeks with a 20% non - refundable deposit. Please be aware that items are 'vintage' or 'antique' and are sold "as is". Wear and tear is both inevitable (and desirable!) - therefore each piece may have flaws, dents or scratches. We will always point out and photograph, anything that is noticeable. We always try to buy our items, in the best possible condition but as vintage, they are often not perfect. We will describe things as best we can, and always list additional photographs for you to consider before buying. If you have any questions please ask. Dating items can be tough and we try as hard as possible, to be accurate but we cannot be responsible for any errors, so please make your own independent inquiries. If you are not happy with your purchase, please contact us within five business days after receiving the item. If you decide to return the item, it must be posted within those first five days. It must be unused, in its original packaging. We will refund you via Paypal. You will have to pay the cost of shipping the item back to me. We will always try to work with you, to solve any problems, as we want you to be completely happy with your purchase. Shipping will be via Priority airmail and we are now tracking all parcels. We will combine shipping for multiple orders. Please contact us to arrange this. If you'd like insurance on the item being shipped, please convo us first. We aim to dispatch items within three working days and we will let you know if it's likely to be longer. If you order from America, your items may take longer to arrive, due to the security measures now in place. We try to use recycled packaging wherever possible. If we are able to combine postage, and the postage is reduced we will refund to your Paypal account. I am unable to mark parcels as a gift or reduce the value. Please do not ask me to do so. Feedback will be very much appreciated. If there is anything in particular you are looking for, please let us know and we will see if we can help.